Not many people know that the founder of AC Milan and father of Italian football was not a Paolo, or a Franco or a Giovanni…...but a Herbert. Herbert Kilpin was a Victorian textile-worker and amateur footballer, who left Nottingham for Italy in 1891, never to return to the land of his birth. Although he died in obscurity and poverty in Milan in the middle of the Great War, the club he founded went on to become one of the most famous and successful in world football. Kilpin lived, first in Turin and then in Milan, through an extraordinary period in the development of modern Italy. 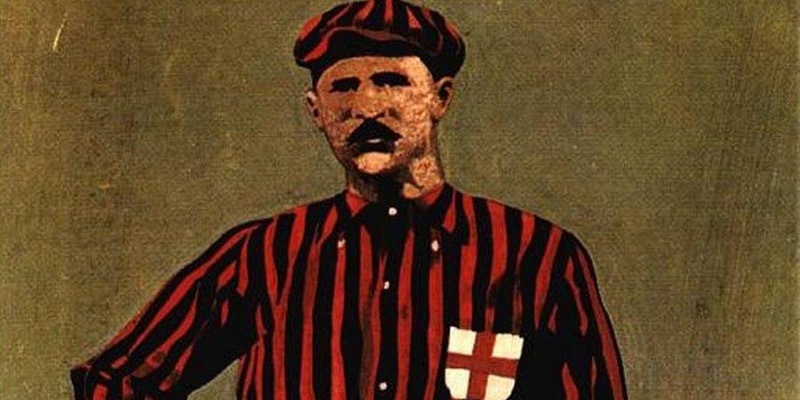 A century after his death, Kilpin has become the figurehead of the fans on the Curva Sud of the San Siro stadium in Milan. His uncomplicated love of the game, and for the club he founded, serves as a counterpart to the commercialism of modern calcio. Robert Nieri spent the best part of a decade researching Kilpin's story before launching his book at il Milan to mark the centenary of Kilpin's death in 2016. The following year he helped bring to the big screen an award-winning documentary about Kilpin and the fans he continues to inspire. Robert has also been instrumental in acquainting the people of Nottingham with one of the city's most influential sons. Kilpin's birthplace has been renovated; a heritage plaque has been placed on its façade; a Kilpin bus arrives at a Kilpin bus stop outside his house, and passes close to the Kilpin pub in the city centre. The primary school children of Nottingham compete for the Kilpin Trophy in the park where Kilpin played football as a teenager over 130 years ago.